There's a lot of good and a lot of bad connected with growing up and living in Canada's largest city. I like to focus on the good, especially when it comes to being a professional sports fan. We are the only Canadian city to have professional baseball and basketball teams. One of my favourite indoor winter activities is catching a Raptors game at the Air Canada Centre. I'm not what you'd call a huge basketball fan, but I am a HUGE fan of The Raptor. 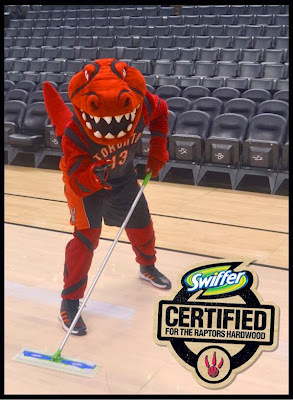 As I P&G mom I'm excited to share that this season Swiffer is Certified for the Raptors Hardwood. 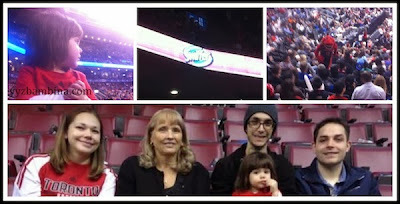 Recently my family attended a Family Fun Day with Swiffer and the Raptors. Because it was a Family Fun Day game, Hannah got a colouring activity book and a bag. Older kids also had the opportunity to shoot baskets after the game…standing on the Swiffer Clean Hardwood floors! It was neat to see the Swiffer cleaning crew - including Stripes, The Raptor's cousin (The Raptor is injured so Stripes is covering for him this season) - at one of the breaks in the game. They definitely gave cleaning a whole new meaning, and I couldn't help but wonder what Swiffer scent they had used (my favourite is Gain Original). There are many more Family Fun Days happening this winter - and if it stays this cold I know my family will definitely be attending a few! Have you ever been to a Raptors game?